This past week Sophie, Countess of Wessex was in Canada, Princess Stephanie of Luxembourg celebrated Luxembourg National Day, and Crown Princess Mette-Marit took part in the Royal Silver Jubilee Tour in Norway. Prince Edward and Sophie, Countess of Wessex took a four day tour of Canada this week. They arrived in Toronto on June 21. Sophie wore a pink Issa dress, a black jacket, and Heavenly Necklaces “Gold Pearl and Large Starfish Earring” (£48.00). On June 24, Sophie attended the opening of Light Horse Park in Old Strathcoma, Edmonton. She wore a white jacket over an Erdem floral dress. Sophie gave a speech. Because I know some of you are interested in how much Sophie spends on clothes, most of her clothes for this tour were repeats, but she debuted a new Victoria Beckham black curve neck pencil dress at the Globe Theatre Gala on June 22. The dress costs $2,395. Go here, here, here, and here to see Anna’s coverage of Sophie’s tour over at the Countess of Wessex blog. Luxembourg National Day celebrations also took place this week, on June 22 and June 23. On June 22, Hereditary Grand Duke Guillaume and Hereditary Grand Duchess Stephanie visited Esch-sur-Alzette. The couple laid a wreath at a war memorial before doing a walkabout of the city’s associations and organizations. In the evening of June 22, the Luxembourg Ducal Family gathered for a Torchlight Procession before watching a firework display. In the morning on June 23, the Luxembourg Ducal Family attended an official ceremony at the Philharmonie. The family were joined by members of the government, representatives of the judiciary, and the diplomatic corps. Top row (L-R): Princess Tessy, Prince Louis, Prince Felix, Princess Claire, Princess Alexandra, Prince Sebastien. Bottom row (L-R): Guest, Guest, Grand Duchess Maria Teresa, Grand Duke Henri, Guest, Prince Guillaume, Princess Stephanie. In the afternoon, the Grand Ducal Family attended a Te Deum at the Notre-Dame Cathedral. L-R: Guillaume, Stephanie, Felix, Claire, Henri, Maria Teresa, Louis, Tessy, Alexandra, Sebastien. Stephanie wore a blue lace dress from Valentino, and Claire wore a purple French embroidered dress from Vilshenko (was $2,185, currently $874). 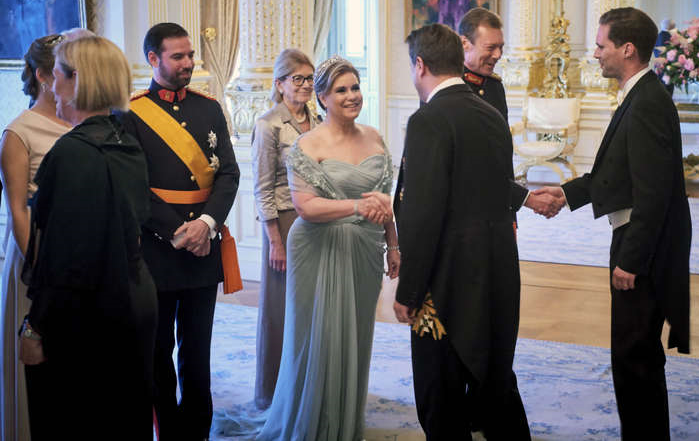 In the evening of June 23, the Grand Ducal Family attended a gala reception for members of the government and diplomatic corps. Maria Teresa wore the Elie Saab gown she wore to Crown Princess Victoria’s wedding in 2010 along with the Belgian Scroll Tiara. Stephanie wore a Paule Ka draped back gown ($1,260) and the Diamond Butterfly Tiara which she debuted in 2014. Claire wore the Grand Duchess Marie-Adelaide Tiara for the first time. Tessy wore a Marcin Lobacz gown in the Luxembourg colors with matching orange shoes, and the Diamond Vine Leaves Tiara for the first time. Alexandra wore the Chaumet Diamond Choker Tiara for the first time. Here’s a gallery of photos from the gala over at Rex with close ups of the tiaras. Speaking of Princess Claire’s Vilshenko dress, Crown Princess Mette-Marit wore the exact same Vilshenko dress on the same day over in Norway. The Royal Family of Norway were in Trondheim, Norway for the Royal Silver Jubilee Tour. The Vilshenko dress was worn to a garden party. 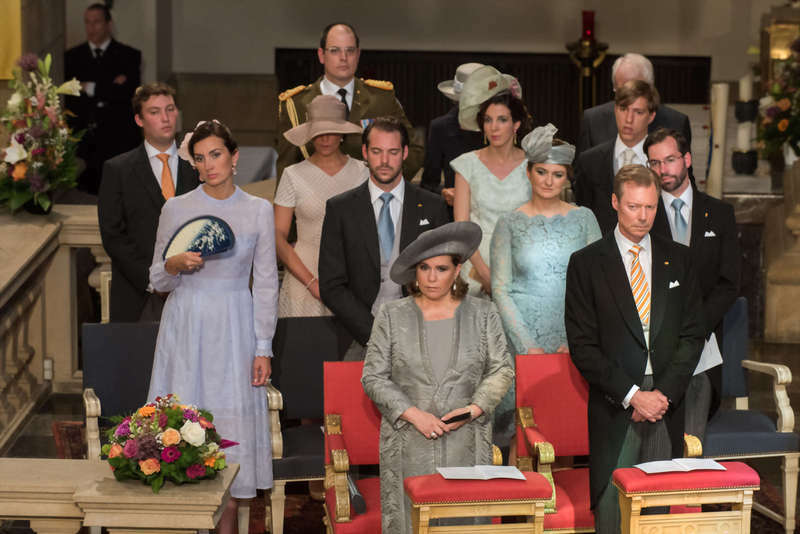 Earlier in the day, the royals attended a church service. Here’s Mette-Marit with Crown Prince Haakon, Marius Borg Høiby, Prince Sverre, and Princess Ingrid. Sophie does not look 16 years older than Kate! I am unconvinced by her wardrobe (that includes the hats at Ascot, a dark jacket over a light coloured dress, jacket over dress at all, in fact), but I very much like her demeanour. She looks friendly, engaged, caring, switched on. Going by pictures only, she seems to make herself a part of an occasion, not stand out in it. Sophie looks fabulous for 50! It really struck me how Sophie looked really fresh face and young in those pictures where she had her hair down. I think the difference between her and Kate is she seems to genuinely care. So when she smiles, it warms you up. Kate just looks really fake. Really loved the instagram picture of Tessy in the teal dress. Actually, I think it’s really cool and down to earth that she has an instagram account that is hers and not run by her staff. It actually gives a glimpse of what her life is. I would love it if Kate actually did something like this. Hi Miss K! I would like to add, that imo another difference between Sophie and Kate is that Sophie seems to quite happy and content with her life. She is comfortable in her royal role, her children are growing and appear to be doing well and Edward always seems to be quite smitten with her. Also, she is training to take part in a multi-day bike ride on behalf of one of the Duke of Edinburgh’s charity schemes and we all know how serious exercise can raise endorphin’s and make one glow. Hey Lauri! Not sure if you saw it, I posted a link at the end of the last post about why generation y is so unhappy. And being a few years younger than Kate, I find that a lot of it does ring true. And if you read it with the context of “bagging William” instead of looking for a career, it makes a lot of sense as to why Kate seems so unhappy. I like Sophie because she actually tries. I believe she likes what she’s doing. And from what I recall, wasn’t there a bit of a scandal with her work when she first married Edward? (Still sleep deprived over here.) But she overcame those scandals and has turned into a great asset to the royal family. Totally agree Miss K and Lauri from Ca. The differences between Sophie and Kate goes beyond appearance, it’s a matter of caring and being happy with they are doing. I love Sophie. She is always so classy, warm, elegant and just a decent person. People enjoy her as they should. She’s a great representative for the UK and she and Edward are very sweet together. I like them a lot. Sophie’s whole look when arriving at TO airport, from hair to earrings to smile to outfit, is one of my very favorite of hers. That Issa dress is so pretty, and she looks lovely in pastels. Good evening everyone, only just now back on Internet, bad storms up my way, no access till just now, 2 days without internet, awful! I think Sophie looks terrific, she is dressed appropriately and accessories, hair. makeup etc. just right. She looks nice in her outfits because she is a healthy weight. Her face glows. I don’t think she gets acknowledged for the effort she puts into her charities and causes she supports. She handles herself with dignity and as Ellie said with class and I believe a natural warmth. I love the photo of Sophie giving little one a cuddle, I love how she is looking at her, nothing stageed, priceless. The first photo of Jessie of Luxembourg looking over her shoulder, that is beautiful, she looks regal and refined. Colour scheme wise, slightly unusual, but she pulls it off, I think she looks lovely. I’m surprised to see Sophie in Issa! I thought that brand had become a no-no for the British royal family…??? Me too Charlotte. I read Kate doesn’t wear Issa anymore because of the conection between the fashion house and Al Fayed family. I love Sophies starfish earrings… She wears jewelry styles that are actually affordable and beautiful, unlike the multiple colors of basically the same earrings again and again and cost an exhorbitant amount for what they are, like Kate. I think that if Kate had to work for a living prior to marrying William, she would exercise more discretion in her purchases, instead of the flagrant disregard she has shown regarding same. I remember when her mother was bankrolling her, she did not buy expensive dresses, and other clothes. Also, Kate wore a lot of costume jewelry. She entered the marriage with a reasonably priced wardrobe, and not much in the jewelry department. However, now that Charles is footing the bills, it’s obvious Kate can’t seem to get enough of the real stuff and there isn’t a ceiling on her spending. It’s such a shame that Kate wastes so much money and is oblivious to the needs of poor worldwide. It’s as though Kate says to herself, fine, if they want me to work, then they can pay for my time. And, even though she lavishes such wealth on herself, she does not appear to be happy. I honestly feel that she has some mental problems and the mental health charity she is pushing speaks to her state of mind. Kate doesn’t know the value of the dollar. She has no concept of what it means to work for a living. Her parents bankrolled her and that’s a great luxury to have, but they did a disservice to her. I grew up in similar circumstances to Kate. Boarding school, parents who did bankroll me, upper crust society life, etc. But as soon as I was legally able to work, my parents made me get a part time job. They stopped paying for my credit card. They slowly started having me pay for my own bills. Were they there to help me out if I REALLY needed it? Sure! But, I was on my own. They made me get a student loan for university. They wanted me to know what it meant to get a loan and to pay it back when I graduated. When my dad passed away, he had it in his will to use part of his life insurance money to pay off the student loans for my brother and I. And I’m very grateful for that, but there were a few years when I had monthly payments to pay back the $30k I spent on school. Kate never had any of that. First her parents, now Will & Charles. All she did was open her hands/bat some eyelashes/flash/etc and it was given to her. This makes for a terrible princess/future queen consort. She claims to want to be normal like the rest of us, but she is so far removed that she has no idea what’s actually going on. Very nice photos of Sophie, Edward with members of European Royalty. I’ve always liked Sophie. To me, she is not stuck up and is comfortable in her own skin. I think Sophie and Edward make a very nice couple, and are great representatives for the Queen. They seem to have a sense of duty and their station in the BRF. Sophie looks much younger than 50, and it’s obvious she takes good care of herself. IMO, most women look healthy and have a glow when they follow a healthy diet regimen. It’s a shame that Kate seems to think to the contrary. I like Stephanie and love her warm smile , lovely couple she and her husband . Sophie looks amazing! And not only by the clothes and hairstyle she chooses but she as a person looks great! Her personality shines through and the outfits just adds a little extra. And she always seems so caring, and interested when she meets people. It’s still her work and she has to be there but she seems to take it serious and wants to be there for people as much as she can. I have to admit I don’t know much about the Royal Family of Luxembourg but always nice to get information on other Royals too and what they are up to and work with. Sophie looked great. It’s too bad they didn’t get the kind of attention W&K did during their visit. I know it’s not the same (heir to the heir and his WAG wife), but it would have been nice for them. Sophie looks very much at ease when she’s giving speeches and I’m pretty sure it’s because of her former profession. I wish she would give Kate some pointers. The other royal women looked lovely as well. It’s always a treat to see the other royal families and what they are up to. My only request would be that someone take Stephanie in hand and help her with her wardrobe. Her clothing is usually ill fitting and matronly looking. The dress Tessy wore was fabulous. And I always love how they include Marius in the events. That is so great. I couldn’t imagine the BRF doing something like that. It’s worse, Sophie is actually 16 years older, not 14 (50-34=16), that’s almost a generation older, she has beautiful skin. Please, correct me, but I thought Sophie was 51. Didn’t they do a big magazine photo shoot at Bagshot the year she turned 50? Yes. Sophie turned 51 in January of this year. Thanks for the great post KMR!! Sophie has long been one of my favorite BR woman, right after the Queen. She’s drama free, knows what is expected of her and is willing to do her part with a great deal of warmth and cheer. I agree with Rose, that Sophie doesn’t look anywhere near 14 years older than Kate, her skin is simply radiant and glowing. I would love to know her secret! Thanks for coverage of the Luxembourg royal women. I really liked Tessy’s gown, the colors are such a fun nod to Luxembourg while they also suited her perfectly. Of course, Claire looked lovely as usual but I’m not a fan of the Valentino Little House on the Prairie look and I didn’t like it any better on M-M. I do wish that Stephanie would find a stylist, her fashion choices are much to matronly and blah for such a lovely woman. That blue lace dress she wore to the church services wasn’t flattering for her at all, well the color was nice but other than that no. And her hat just needs to be hid in the far reaches of her closet, never to be seen again. Be still my heart. I showed the Google results to my nurse. We literally drooled over the pictures. Thanks! Mr. Rhiannon is adorable. Oh Rhiannon, your MR is reaaaaaaly great. I remember during the Invictus Games there was a reporter from CNN who talked to him and guess what was her name???? “Rhiannon”. I was very delighted to see Harry with this Rhiannon and I thought about you, and how the expression “Harry and Rhiannon” sounded good. Great. Have a wonderfull day. Matty, what a wonderful treat for Rhiannon and all of us, too. So sweet and thoughtful of you! When I saw those pics I knew they would cheer Rhiannon. I’m glad you liked them as well.Go Harry. Did anyone notice that there were two Backstreet Boys sitting next to the royals at the concert?! Kevin and Howie. That was a great video, thanks for sharing KMR! Not only she looks good, but I love Sophie’s voice : she is very good to make speech : it is very clear and easy to understand what she says for a non English speaker. Lovley post. I adore Sophie. She’s hardworking, loyal to HM, and obviously enjoys her work. I think that beauty is not always what’s on the outside. It also emanates from the inside. I love seeing MM. I think Sverre is a cute little boy. He also looks a bit cheeky and I love it. The Luxembourg RF is new to me. Stephanie is a pretty woman, but she needs a stylist. Good news on my end. I do have Guillain Barre. The MRI confirmed it. I have to spend a few extra days at the hospital for treatment. It sounds like I will have a tough road ahead of me regarding physical therapy and treatment. I joked with my friends that I always thought I was a one in a million type girl. Apparently, I am one in 20,000. Thanks for such a nice review to end the week. I love Sophie… I remember when she got married I loved the medieval flare to the wedding. I also love those starfish earrings. I liked reading about the LUX royal family. I do not know much about them. Does any one have a good story or link on them? I am a bit biased, I like seeing a fuller figured female royal. I like seeing what she wears. I am also a fluffy wench, and I like seeing a royal reflect my stature. Its nice. Now to know more details on her clothing. I understand how a diagnosis can be good and bad news. I hope that your recovery is quicker than they estimate and that you are feeling better soon. Hi Fumama, here’s a link to a great site all about the Lux royals. Thank you! I would have been facing some other diseases that wouldwould have been difficult to process. This isn’t going to he easy, but it will be cured. Thank you so much. There’s a reason for this. I’m thankful for having a doctor who advocated for me. We’ve pinpointed when I might have been exposed. It was probably around the time I had food poisoning and the gastrointestinal distress. So, I plan on doing what i need to do to get healthy and strong. You all will appreciate this: I was finally able to take a shower today. I pulled my hair up in a high pony, put on a dress and some lippy. Mind you, I can’t walk far and my gait is similar to ET, but I wanted to feel like me again. Oh god, I know it’s amazing how great a shower, dressing up a bit and putting on a bit of lippy can make one feel!! I’m so glad that your mental state appears to be strong. Not meaning to sound preachy but I’d like to share a bit of my story with you…I have been dealing with chronic back pain for about 5-6 years now and it can definitely take a toll on my spirit but about 3 years ago, while meditating I asked that the Creator not let the pain I was in to go to waste but that the suffering I was experiencing could be used to lessen the suffering of another. In that moment I clearly saw a little, old lady quite crippled with pain and knew that the pain I was experiencing would, at least on a spiritual level, help relieve her suffering. Now, when my pain flares up, knowing that this lady’s suffering is lessened really makes what I’m going through much more bearable. As you mentioned there is a reason for all that we go through, sometimes it offers us a chance to better know ourselves, sometimes it offers us a chance to help others, sometimes it offers us the opportunity to be grateful for all of the blessings we have even in the midst of suffering. I agree, Lauri. I’m on an oncology floor here due to a bed shortage. It made me reflect. It also put this into perspective for me. I’ve had to do a lot of self evaluation and I needed it. I’ve made my peace. But I also allow myself to cry and laugh and smile. I’m sorry to hear that you do have GB, I am pleased they have given you a proper diagnosis so you will get the right treatment now. I know it will not be fun at the moment but know you will get through it and the nerves will heal. How do I know? I know someone with GB. She had a bad stomach flu/ virus just before Easter, by Easter she was hospitalised and almost could not move anything. I saw her by chance last week in the charity shop where she is a volunteer. She was looking unsteady but as she said… when she was hospitalised she could barely move and when I saw her she was celebrating because she could feel the floor under her feet and she could walk and more importantly hold a cup of tea. She said everything will heal and she is due to be back working in the charity shop by Christmas. This lady is in her 80s. I hope it will help to hear how others are doing getting through the recovery? I gave her a hug and I’m sending cyber hugs to you too!!! I bet the physicians and RN’s love you. What a great attitude! I’m glad to hear you will be hospitalized for a few days and soon back at home. Nothing feels better than your own bed and a little peace and quiet. The photos of Prince Harry at the rugby match must have been as good as a new stack of old-fashioned get well cards. I am off to google Prince Harry Stockport Rugby. Sending best wishes for continued progress. Take care. We have all been thinking of you. Have been consumed by other things of late and did not look through this post,. Am just reading about your diagnosis and your hospitalization. My heart and prayers are with you!!! As you said, you will beat this. Others are in your corner, too. We all love you and send healing thoughts and prayers. Those photos of Harry are just what the doctor ordered! Keep him at the front of your mind and remember that “this too will pass,” and you will be back to your self in less time than you think. If we cannot be there to visit you and help in any way you want, we can at least send you our best thoughts and let you know that you are a shining star on this blog. hi R – i have had more than 2 doctors say that they want to write a paper about my wonky health issues so we may be soul mates. i am so sorry and yet so happy. now you know and you can fight and it will be all over before you know it. hang in there and lean on us for support. we are here. Thank you! This is rather disappointing because I started to become healthier last year. I’ve run 15 races since October. But I also think that my training and prep will allow me to rehab and get better. your Physicaland mental training will get you through, as will loved ones and friends you have never met! Hang tight! You have a strong will that has gotten you through training for many races. We are all pulling for you. At tbis point, we think my immune system was compromised between my food poisoning and stomach bug. Thankfully I received my flu shot in October. I’ve never met you personally but will say a prayer for you as well. You’re a runner, so try to break down your progress into mile markers so as you pass them, you know you’re that much closer to the finish line. I wish Harry could find out about this and drop by to cheer you up, but if you don’t want him to see you like this, he should at least send flowers! Stay strong in spirit and be patient as it may take some time for your body to gain strength back. Any cute doctors or nurses? Rhiannon, may you be blessed with good doctors and treatments and may the training you have been through this year work in your favor as you recover! My goodness, this came from out of the blue. I say, send it back there! I also wish that someone could get a message to Harry and have him fly back to the States to visit you. If he cannot do that, a letter? Flowers? Someone needs to remind him that he has met you at the IG and that you could use a boost right around now! Know that we are here for you and wish you the very best. I am sure you will handle this in the strong and capable way that you handle everything else. If I lived near you, I would do whatever I could to make your life easier now. I know you must have dear folk around you who will want to help you, too. Here in cyber world, we are all thinking, praying and hoping for only good things for you. Take care and know how important you are to us all. Oh no. xoxoxo I hope you feel so much better soon. I just looked up Gullain-Barre Syndrome. I want to say something jokingly sarcastic (since I know a thing or two about hospitals and doctors 😉 ) but I won’t but I will say this: If you ever want to vent or whine or whatever, you know I’m here! Also, good luck sleeping in a hospital, I know how sucky that can be! I totally agree with you regarding Sophie. She truly came from a “middle class” background and worked her way up, plus, she was a real career woman while dating Edward. I didn’t really notice MM until the previous post with CP Victoria and watching her speech–wow!! I’ve really warmed up to her now!! Regarding the Luxembourg Royal Family? The only gown I like is Tessy’s (note to self: follow her on Instagram!). It’s so vibrant and the orange is nice and subtle. The others are “meh” to me. Happy to hear that they’ve figured this all out. Now on to getting yourself better. It may be a tough road ahead but I don’t see you as a quitter so I know you’ll come through this with flying colors. As Kimothy said, getting rest in a hospital is a joke. Been there, hoping not to go there again any time soon. Know that you are in all our thoughts and prayers and are here when you need to vent and to give us updates. Now, how do we get a message to Mr. Rhiannon so he can lend some support??? Rhiannon, you have been in my prayers. I’m glad you have a definitive diagnosis so that your doctors and you know what you’re dealing with and how to get well. I will continue to pray for you. Now, off to google Guillain Barre. So glad you are doing better, and hope you feel all the strength and positive energy from everyone here to you. The flat is coming, you are strong, and I send you all my best as your fight through. Will you cover the mountbatten wedding? The queen looked great. I agree Mel, the Queen’s dress was so lovely and of course Phillip and Charles looked rather dapper too! Plus there seems to be an interesting back story as to why Charles walked to bride down the aisle in place of her father. The bride’s father left for another woman ages ago and pretty much cut off all contact with his children. Some father. He lives on the estate or something but not with the family AFAIK. It is very sweet for Charles to have done that.